WASHING MACHINES are owned by 96% of UK homes and they work hard too, going through an average of 250 standard wash cycles each year. As much as 90% of the electricity used by a washing machine is used to heat the water, EcoFrenzy will show you how to save energy, water and the environment when using your machine. 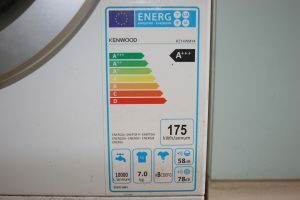 If you need a new washing machine aim to buy one rated A+++, they are far more efficient and use less energy. A single large washing machine load saves between 25% and 50% of the energy used in 2 small loads. You may be using up to six times the detergent required – this makes your machine work harder and use more energy, especially if you live in a soft water area. Contact your water utility company and check the water hardness in your area, your appliance manual will tell you how much detergent you need for your water type. Be sure your clothes are dirty enough to really need washing! There is a sensible trade-off between smelly clothes and washing things unnecessarily. Minimise washing by hanging up clothes to air after wearing them. Reducing the number of washes saves energy but also time. Drum sizes range from 5.5kg to 11kg but as a machine runs most efficiently when full, it’s worth checking you have chosen the correct machine. A 6-7kg capacity washing machine will normally be sufficient for a couple, a 7-8kg for a family of four and 9kg for a larger family. After clothes have been washed, try to air-dry them, avoid the dryer function of the washing machine. The dryer uses a large amount of energy, so it’s cheaper to hang your clothes to dry, even if it’s inside. The manufacture and delivery of an appliance accounts for 10% of the total carbon footprint of each washing machine. Detergents and stain removers frequently contain alkylphenol ethoxylates (APE’s), these are surfactants (surface active agents) which help water penetrate under dirt and grease on surfaces like dishes, hands, and fabrics, allowing the water to carry the dirt away. Unfortunately APE’s can damage the immune system, and they’re suspected hormone disruptors, mimicing hormones in the body that regulate reproduction and development. Adding a 200ml cup of distilled white vinegar to the wash, instead of a synthetic softener, helps wash the soap out of fabrics, leaving behind just the fluffy goodness of your clothes! If we washed all our clothes in hot water, they would soon look pretty shabby. Hot water damages some fabrics such as wool and shrinks others such as linen.